As always, we want to communicate this progress with you in form of a monthly report and thus be as transparent as possible. Let’s start with the usual development tasks. In January, we have launched an important element of LockTrip — our customer support. It is now very easy for customers to reach our team in case something does not work as expected or additional help is required. The FAQ was launched together with the customer support and has since become an integral part of providing information to customers and LOC holders. We have also integrated LOC with another wallet provider. 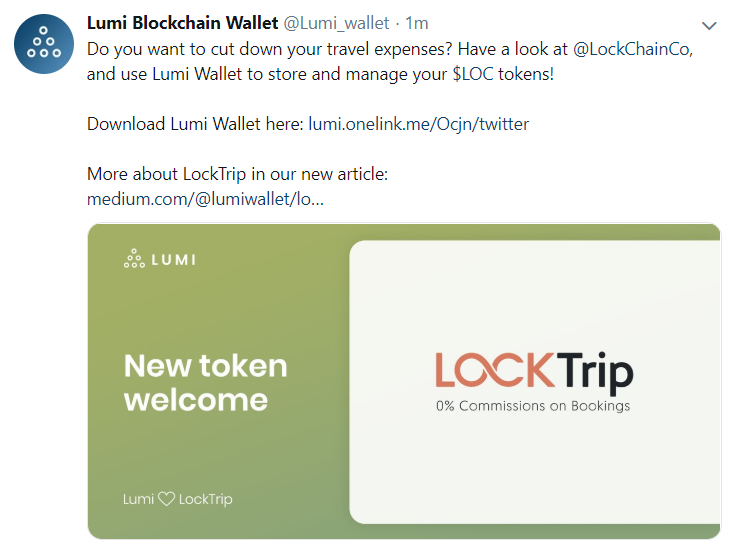 You can now store your tokens at the Lumi wallet, which has both mobile and browser applications. During January, we have initiated the work on an extensive price comparison analysis for the upcoming 300,000 hotels inventory. We communicated in previous articles that we expect our competitiveness to improve with the added inventory. We are now preparing to back up our claim with numbers. A similar analysis was published by LockTrip in April 2018 after integrating 100,000 hotels on our marketplace. January was also a month of developing important security features, which will be launched with the next major marketplace update. A few of those features have been fully developed already while others are being worked on as we speak. At the end of January, we also completed the draft for the new version of the whitepaper and have since provided it to our core community for review and suggestions. Thanks to our community, we also won the community voting for being listed on Ethershift, which offers direct LOC conversion with multiple Ethereum based tokens, including Ethereum itself. As it is evident from the development tasks, we are already testing some of the testnet features extensively. Together with the development of the tools for tracking network stability, much is happening on the blockchain front. Thank you for being with us on this very exciting road.